Details: 3 Bedroom, 3 Bathroom, approx. 1,700 sq. 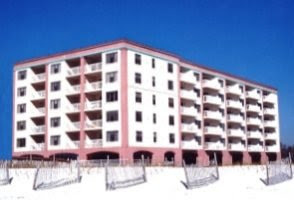 ft.
Info: Gulf Shores Condo For Sale at Bay John. This beautiful condo comes fully furnished with a deeded boat slip, deeded covered parking, and outdoor storage. Bay John also offers a screened in pool and spa area, exercise room, and benches on the dock to watch the wonderful sunsets while grilling your catch of the day. Details: 2 Bedroom, 2 Bathroom, approx. 840 sq. ft.
Info: Gulf Shores Condo For Sale at Gulf Village. Totally new kitchen with new counters, cabinets and stainless steel appliances. Gulf views and lagoon views from a huge wraparound balcony. This spacious top floor 2 bedroom. condo is a perfect beach getaway with cool gulf-front pool and a private fishing pier on Little Lagoon across the street.